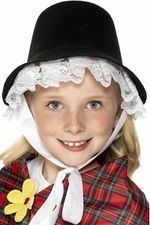 Available Sizes/Colors: Size "S (4-6)" "M (8-10)" "L (12-14)"
Be a part of history in this child size colonial peasant girl costume! Includes gray and blue poly poplin dress, white apron, and white cap. Stockings and shoes not included. See more options and accessories in our Colonial Costumes section!